I've used music trackers in the past, specially ModPlug Tracker (now called OpenMPT), and I never knew how to insert tuplets. In the image above (from Wikipedia), you can see the characteristic vertical patterns of tracking editors. It's all very intuitive until you want to put a triplet here or there. How do I add, in my case, triplets to a mod track? Q: How do I write triplets? A: There are several valid ways to insert triplets in your module, but one of the most common ones is to use the Gxx command. If your module's tempo and speed are set to 150 and 6, respectively, then you can use G02 and G04 on your triplet's second and third notes, and you will get perfect triplets. Bear in mind that if you are using a different tempo, different values will be required, so mess around with that until you get the sound you like. 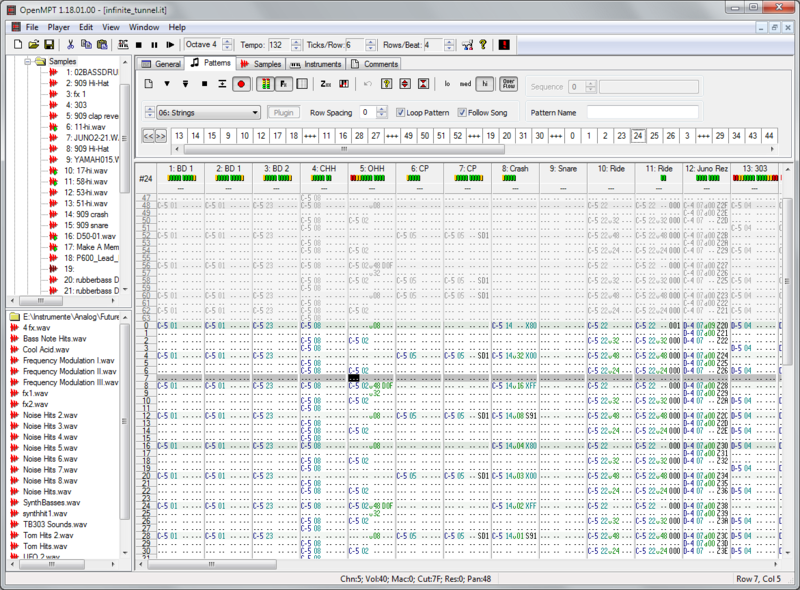 This Gxx command is the note delay effect in FamiTracker. According to the OpenMPT Wiki, the command for the note delay effect in OpenMPT is SDx (x being the number of ticks to be delayed). Set the pattern row count to the lowest common denominator of your time signature and tuplet number. For example, for triplets in a 4/4 time, the pattern row should be set to twelve. Then, quarter note triplets should go on each fourth line, and standard quarter notes in each third line. This method seems kind of obvious now but it never occured to me. I found it in the last message of this thread, in the OpenMPT forums. Not the answer you're looking for? Browse other questions tagged composition software tuplet or ask your own question. How to insert lyrics in TuxGuitar?